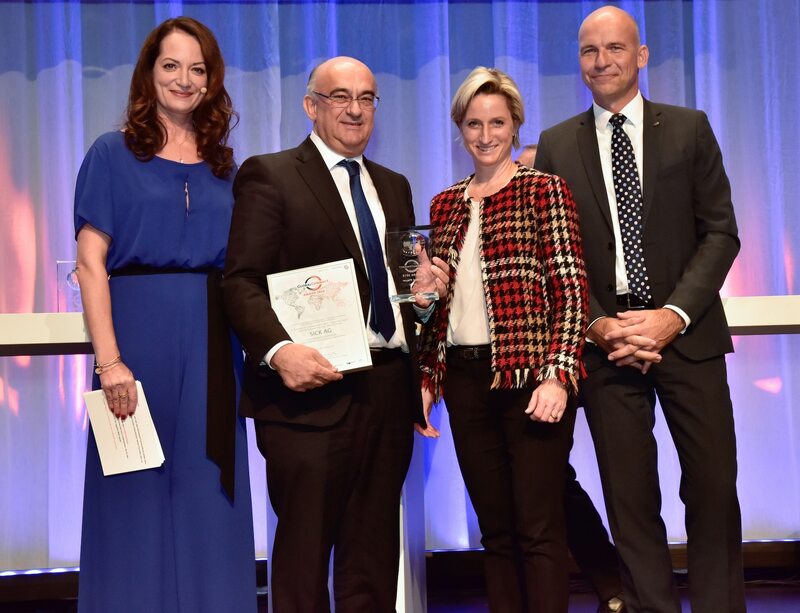 Waldkirch, October 2016 – On Wednesday, October 26, 2016, SICK AG was honored with the GlobalConnect Award 2016 in the category “Global Player” for its outstanding entrepreneurial achievements in export and internationalization. The award was given during the GlobalConnect trade fair, the biggest export conference of the economic organization at the Stuttgart state trade fair, and was presented by Dr. Nicole Hoffmeister-Kraut MdL, Minister of Economic Affairs, Labor, and Housing of the German state of Baden-Wuerttemberg. Companies that successfully link up and integrate business and production processes across the globe and that make a special contribution for the environment and society are considered in the category “Global Player”. A panel of experts decide among these companies and evaluates them using in particular the criteria of global presence, social and ecological standards, and unique selling point. “We are very pleased to have received the award; it means both for us confirmation of our excellent performance and an inspiration to keep it up. It is recognition of 70 years of SICK’s global development. We will continue to set standards with our innovations across the globe in the sensor technology industry and promote confidence in worthwhile and sustainable technologies,” says Dr. Robert Bauer, Chairman of the Executive Board at SICK AG. It is considered to be the “Business Prize for Business”: In 2016, the GlobalConnect Award was presented for the fifth time during GlobalConnect, Germany’s biggest platform for exports and internationalization. The national, cross-sector award honors excellent entrepreneurial achievements in foreign business. After a strict selection procedure, a high-level panel of experts determines the winners in the categories “Newcomer”, “Hidden Champion”, and “Global Player”. The decisions are based on criteria such as niche occupation, networking, or a special contribution for the environment and society. SICK is one of the world’s leading producers of sensors and sensor solutions for industrial applications. Founded in 1946 by Dr.-Ing. e. h. Erwin Sick, the company with headquarters in Waldkirch im Breisgau near Freiburg ranks among the technological market leaders. With more than 50 subsidiaries and equity investments as well as numerous agencies, SICK maintains a presence around the globe. In the fiscal year 2015, SICK had more than 7,400 employees worldwide and achieved Group sales of just under EUR 1.3 billion. More information about SICK is available on the Internet at http://www.sick.com or by phone on +49 (0) 7681 202-4183. Dr. Robert Bauer, Chairman of the Executive Board of SICK AG (second from left) receives the GlobalConnect Award 2016 for SICK AG from Dr. Nicole Hoffmeister-Kraut MdL, Minister of Economic Affairs, Labor, and Housing of the German state of Baden-Wuerttemberg (second from right) as well as actress and presenter of the event, Natalia Wörner (left). Also in the picture is Dr. Thomas Götting, Director of Coface Kreditversicherung AG (right).